This week in Reading, we learned about prefixes. We discussed what un-, pre-, and re- mean, then brainstormed words that have these prefixes and how they change the base word. 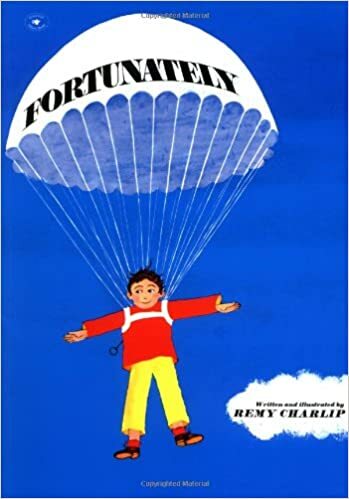 We read Fortunately by Remy Charlip and focused on story structure and prefixes while reading. In Writing, students wrote a story following the same pattern as Fortunately and created a mini-book with illustrations. We loved sharing our finished products with the class! In Math, we finished Chapter 6, which focused on three-digit addition and subtraction with regrouping. Next week, we will begin Chapter 7; students will be learning about money and time. Continue to practice addition facts at home to get them memorized for our timed tests! In Religion, we discussed how Jesus gives us life, what Jesus gave to us at the Last Supper, and how we remember and celebrate what Jesus did at the Last Supper during Mass. In Science, we began Unit 5, Environments for Living Things. So far, we have learned how plants and animals need one another in food chains and about adaptations that animals have to help them survive based on where they live. In Shurley English, we continued to classify sentences with prepositional phrases. In Phonics, we reviewed and took our test on consonant digraphs and r-controlled vowels. In Spelling, our focus was words with ck as the /k/ sound. In Cursive, students learned how to write a lowercase e, l, and b. This week’s newsletter secret is: Catholic Schools Week. We have 8:00 a.m. “E” Day Mass on Friday, February 1st. Catholic Schools Week is next week (1-28 through 2-1). 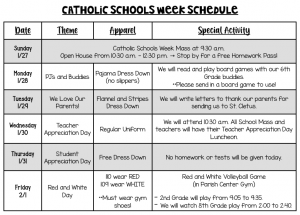 A schedule for Catholic Schools Week can be found at the bottom of this page. Our Second Grade Poetry Reading is on January 31st from 10:45 – 11:30 a.m. Please join us and don’t forget to sign up to bring a snack or refreshment here!